Twelve South’s creative group has been at it again. Remember their TriPod iPad stand? A stand that folds up to the size of a couple pens and opens to a full size stand with anti-slip arms and feet (now available in Red too!). The design folks at Twelve South bring us another bit of design genius… the PlugBug. Using your normal MacBook plug, replace the the removable plug part with the PlugBug. Giving you a USB connector for your iPad, while the normal lower area continues to charge your MacBook. Ending the problem where you can’t get the chargers for both the iPad and MacBook in the same wall socket. Most power strips don’t allow the two to work side-by-side either… problem solved! 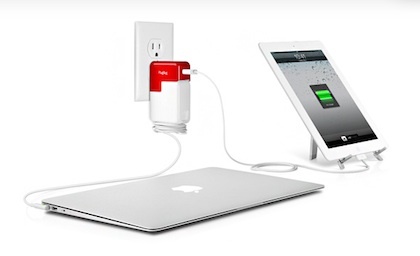 The PlugBug brings you 10W of charging power too, so your iPad charges faster. 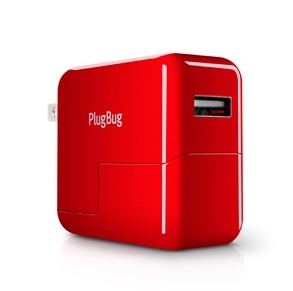 If you don’t have the need to double up the charger, the PlugBug does have it’s own lower area to work as a standalone iPad charge… except in bright Red and the same faster charge. And, yes, it DOES work with your iPhone too.